Such streams of expletives are causing trouble for Mumsnet. On August 19th the Times reported that sponsors were threatening to pull adverts from the website. Among them were Confused.com, a price-comparison site, the National Trust, a conservation charity and Bulgari, a jeweller. They are reportedly wary of being associated with increasingly foul-mouthed mothers. Are they right to fret? 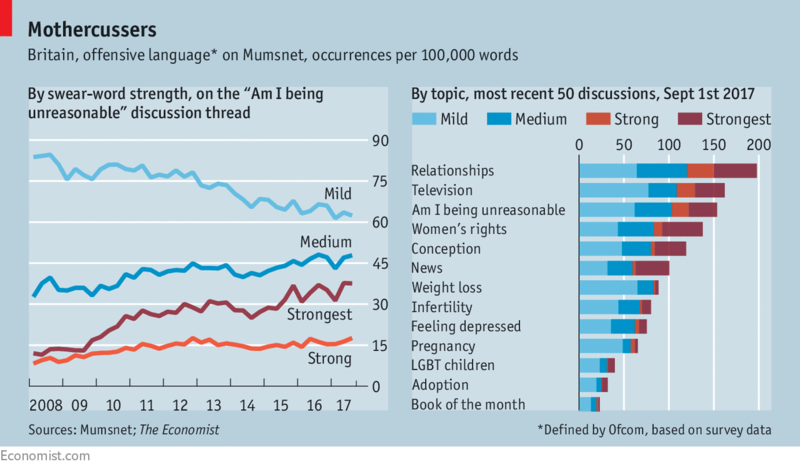 To answer this question, The Economist examined over 200,000 discussion threads from one of Mumsnet’s most popular forums. We looked for instances of the words that Ofcom, the telecoms regulator, deems offensive. The analysis does not capture every curse. Some mums choose to self-censor; others use knowing acronyms (CF, for instance, means “cheeky fucker”). Nevertheless, a clear trend emerges from the number-crunching: swearing is indeed on the rise. The occurrences of what Ofcom deems the “strongest” language (think C-words and F-bombs) have tripled since 2008. Terms which it considers “strong” and “medium” have also increased, at a slower pace. This appears to be at the expense of “milder” cursing (such as “God” and “bloody”), the prevalence of which has declined by a quarter. Unsurprisingly, nothing gets online mums more riled up than talking about their relationships. Much of this is venting about husbands’ emotional distance, flagging libido or adulterous tendencies. By contrast, debates about the book of the month elicit, on the whole, much milder language. My mom has already found my new LA friends on social media and is smashing the like on bikini pics I'm horrified and…proud? According to Mom.me’s Jeanne Sager, the sign was posted at a Texas daycare, where mother Juliana Farris Mazurkewicz spotted it and posted a photo of it to Facebook. 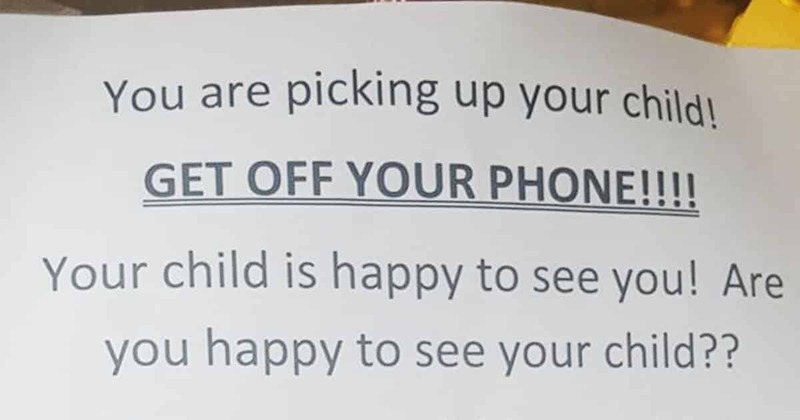 Of course, the combination of daycare and phones is like blood in the water for the sanctimony sharks, and the picture is blowing up with more than 380,000 shares so far. A lot of them are cheering on the daycare, because you just know they’ve been waiting their whole lives to talk about this kind of “neglect,” preferably with a lot of exclamation points and pointed comments about how they “never” do that. …I was always the narrator, the main character, even if I was also the storm-tossed heroine, the hot mess in mom jeans who couldn’t get the overalls on her 2-year-old. Or figure out fourth-grade fractions homework. I was working out my issues. 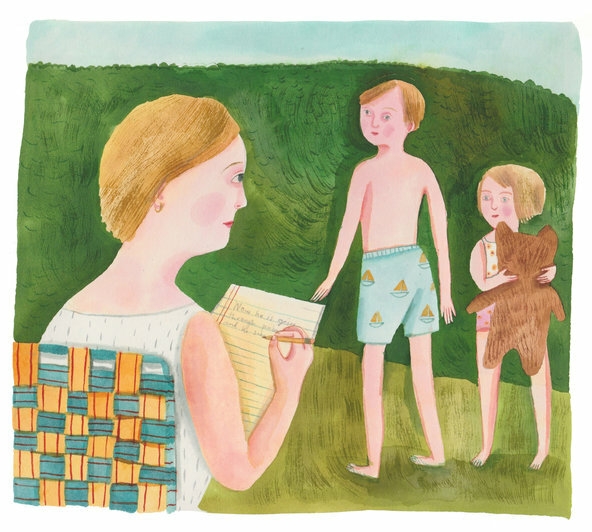 My kids were always satellites to the big round-faced moon of me.